“According to the National Center for Charitable Statistics (NCCS), more than 1.5 million nonprofit organizations are registered in the U.S.” (GrantSpace, 2019). It is hard to comprehend this many nonprofits existing and still so much brokenness existing alongside them, but this is in part due to the ineffective ways well-meaning nonprofits try to serve. When Helping Hurts is a book by Brian Fikkert and Steve Corbett addressing the most effective ways to alleviate poverty. It calls for a shift in thinking. Rather than having a top-down approach where the church comes in and fixes the problem, When Helping Hurts emphasizes a bottom-up approach where the church walks alongside the poor as they fix their own problems (Merlo, 2018). The key to effective restoration is to focus more time and effort on development than on relief. If a doctor sees a patient coughing, he is not going to simply prescribe cough drops—he will give the patient an antibiotic prescription. Similarly, missionaries should aim to not only relieve the symptoms of poverty but empower a community to face the problem head on and defeat the chains of poverty. Too much assistance can lead to a dependent relationship, thus letting a community slip deeper into poverty. Helping can hurt when ineffectively channeled. This can apply to our own personal circle of influence as well. There is a fine line between walking through a tough situation with a friend and walking through a tough situation for a friend. We should always strive to do what is best for the ones we are serving, even if it is more difficult or less fulfilling to us. This is an aspect of Breath of Life Haiti that is so special. 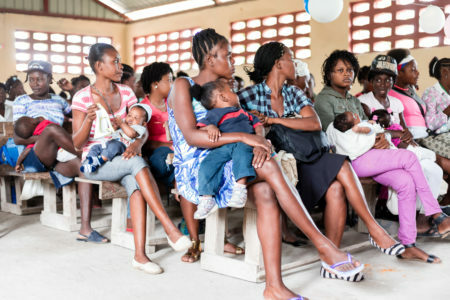 Breath of Life Haiti does not just aim to keep mothers and babies alive; they do not just treat the symptoms of poverty. Breath of Life Haiti equips and empowers women and children from birth to education, revealing to them their potential for success. Breath of Life Haiti trains Haitian midwives and staff members rather than just swooping in entirely with a team from the U.S. to save the day. They are building a culture that can fully support itself someday. It is amazing the impact when those in poverty begin to fight it themselves, and that is exactly the culture that Breath of Life Haiti has created in Dèsarmes. Continue to pray for the development taking place in Haiti and the restorative method Breath of Life Haiti strives to live by each and every day. We are making a significant difference, and through our faith, prayers, and support, we can continue to shine the light of Jesus Christ.